Who created them? Take a look at the pictures. A picture is worth a thousand words. That saying has never been so apt. Yes, who? Are they statuettes? Figurines? 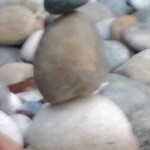 Just meaningless piled-up stones? I think they’re more than that. 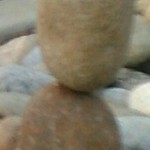 What is amazing is how precariously—how impossibly, it would seem—one stone is balanced atop another. 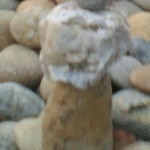 Just think: how many stones do you think toppled before the artist, the creator, whoever, got two of them to stay up? Then three? Then four? Yes, there’s one each of those for a total of four. No glue. Just gravity. Plus enormous patience and skill. I was amazed when I spotted them. I’m still in Morro Bay, CA, where I have been sojourning. Right away I thought of Easter Island. That mysterious island right off the coast of Chile has hundreds of such statues. But these are tiny compared to those colossal wonders. And these were created in a single session, I believe, not over years and years. Yesterday, I suspect, or the day before, not eons ago. But these are fascinating and striking, too. By the way, I’ve never been to Easter Island. I know about those prehistoric wonders only through the pages of the good old National Geographic. And I know zilch about these little ones except that they seem to defy the force of gravity. Those on Easter Island had large, strange heads and they had some powerful symbolic meaning for the islanders. I doubt these were created to tell us something. Just for the fun of it, I’ll bet, or to prove to the maker that he had the talent to do the job, or maybe as a contest between him and a friend. Your guess is as good as mine. I’m sure they weren’t created in the middle of the night. Some people must have seen them being put together. Gosh, how I wish I had been there to see that. 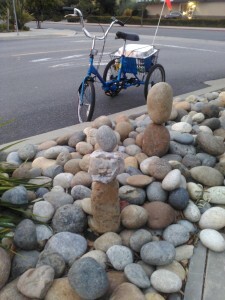 I spotted the statuettes, or figurines, or whatever you would call them, as I was on my way home on my trike from Cypress Plaza. I had just bought a few things. The statuettes were on a small triangle at the corner of the plaza and Quintana Avenue. As you see, that triangle is covered with nice stones. The builder of the plaza must have thought that the stones would be cheaper to take care of than mowing grass regularly. There’s a drought here. That must have been in his mind, too. I was lucky to spot them. They didn’t stand out against all those stones. I saw one, made of just two stones. I marveled how beautifully one perched atop the other. Then another, with three stones. Then one with four. Wow! I had so many questions. Was this the work of one person? Two? Male? Female? Youngsters, I’d bet, but maybe not. How did they get the idea? Did they have a drink or two just before? How long did it take to find the perfect second stone for the first? Each one became more ambitious. A tougher challenge. How many tries for the fourth one, with four stones? How long to build all four? They were done in one session, I would think. Was it done on a whim? And the motive? Why? Why? Maybe you feel I’m making too much of this. Well, maybe. As you see, I was fascinated. Afterward, I pedaled on. I had bought things at Albertson’s Supermarket that had to be put in the fridge. But I kept thinking of the figurines. Just a block from home, I made a U-turn and pedaled back. The sun had nearly gone down. Studied the figurines again, and from different angles. Marveled even more. And took the pictures, using my ever-ready smart phone. Given the poor light, they came out better than I thought they would. Could that talented person…persons…be descended from those far-off Easter Islanders of long, long ago? Isn’t that an interesting thought? Well, I took another look the next day. As I feared, bad luck. Only one figurine was still standing. The smallest. Did gravity bring them down? Did a strong gust of wind do it? Did some jerk pitch stones at them? Will whoever created them come back and try again? If anything develops, I’ll let you know.